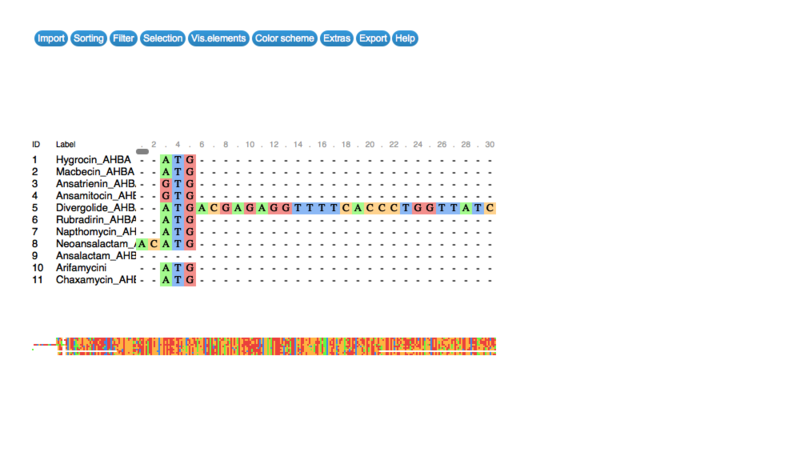 Visualises multiple sequence alignments dynamically within the Shiny web application framework. An XStringSet (Biostrings) including "DNAStringSet", "RNAStringSet", "AAStringSet", and "BStringSet"
An XMultiple Alignment (Biostings) including "DNAMultipleAlignment","RNAMultipleAlignment", and"AAMultipleAlignment"
Any of these types of objects can be passed to msaR to create an html widget. This package in not on CRAN/Bioconductor and can be installed using devtools. See the online docs for an interactive version of this widget. Change the location of the image in the Readme file to be in man/figures as per CRAN policy. Update msa.js to allow Overview Box to scale to the width of the parent Div.